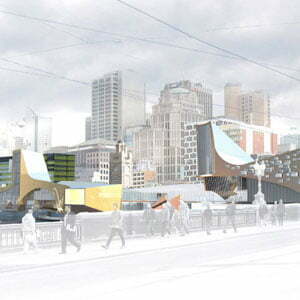 This ideas competition required responses that addressed the commercial, urban, and programmatic renewel of Flinders Street Station, as well as its historic fabric and civic identity. We developed this brief by seeing Flinders Street Station as an unfinished project, the partial edge of a great courtyard with rail lines and platforms at its centre. 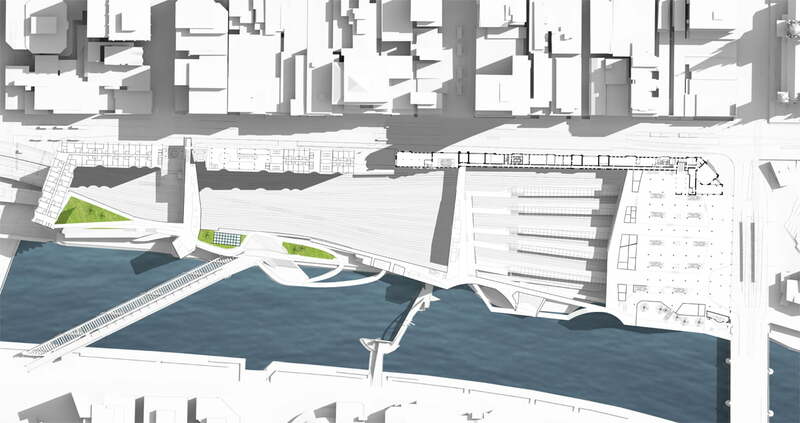 Our proposal completes this rectangle, defining this edge down Flinders Street to Queens Bridge, along the Yarra and across Federation Square. We believe that this Station, and its city, can be transformed through careful addition, not radical intervention. Our proposal responds to the particular physical and programmatic possibilities of the site by providing an architecture of interconnection built around, and across, the site’s perimeter. Three new bridges cross this perimeter. Habitable bridge-buildings, they contain transportation, commercial, public and administrative activities. They link the edges, and overlap their functions with others, drawing a range of activities across the site. Further enriching this mix, atop each of these intersection points is a tower, a vertical laneway of entertainment spaces and public viewing terraces. From the towers the flow of activity, of both the station and the river, can be simultaneously enjoyed. Flinders Street Station is Melbourne’s place of meeting. Our proposal dramatically extends this history, transforming the station into a meeting place of metropolitan, regional and global communities. This centers on the Administration Building. Rather than see it as a series of discrete functions we propose it as a place where aspects of all the Station’s activities intersect. The result is a spatial network combining occupancy with circulation, formality with informality—a scheduled meeting with a chance encounter. 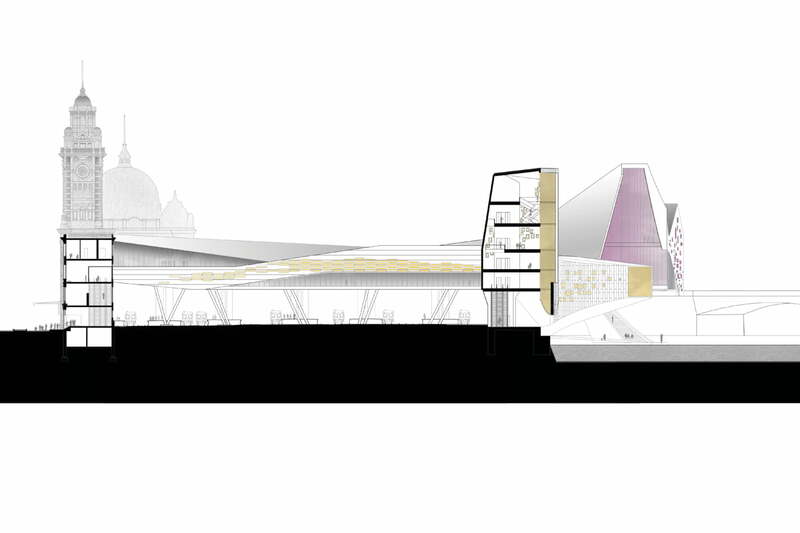 In addition to improved transport operations and urban design, we propose that the station hosts a relocated CAE and City Library, together with a contemporary shared workplace and a suite of seminar, function and workshop facilities; an innovative centre for work, learning and making of international standing. Into this campus we propose something small-scale and generous—an international residency program within the Administration Building that provides creative researchers and practitioners with the opportunity to stay at the station. The Station is a creative resource and venue for their outcomes. Our design celebrates the iconic form of the Station, its surrounding buildings, infrastructure and urban grain. The architecture draws upon these elements in complex and surprising ways, providing an image at once familiar and new. At the western end near the dome and Princes Bridge, across from Hamer Hall, it is elegant and theatrical. Beside the exposed steelwork of Sandridge Bridge and the viaduct its imagery is tougher, infrastructural. Our design vastly improves the transport performance of the Station, at the same time providing a multitude of situations for people to meet, by plan or by chance. We have taken institutions and facilities that are well known and well loved, carefully connected them and expanded them, transforming the Station into a place that not only connects people to the city but also to each other; for learning, working, or for fun, and from central, metropolitan, regional and international locations. What distinguishes the design are the rich combinations of spaces and landscapes created, the positivity by which they add to the Station’s form and connect to the Yarra, and the quality of how all these things occur, together. The station as a place of convergence: for transport, ideas, commerce, and pleasure. Addressing the Yarra west of Queens Bridge: a unique and complex public space is proposed that combines landscape with new functions. Ambition without large intervention. Rather than a single complete solution, our strategy is fundamentally conceived as an incremental project. The historic Administration Building becomes a home for small-scale businesses, public activities and research residencies, bookended by anchor commercial tenancies. 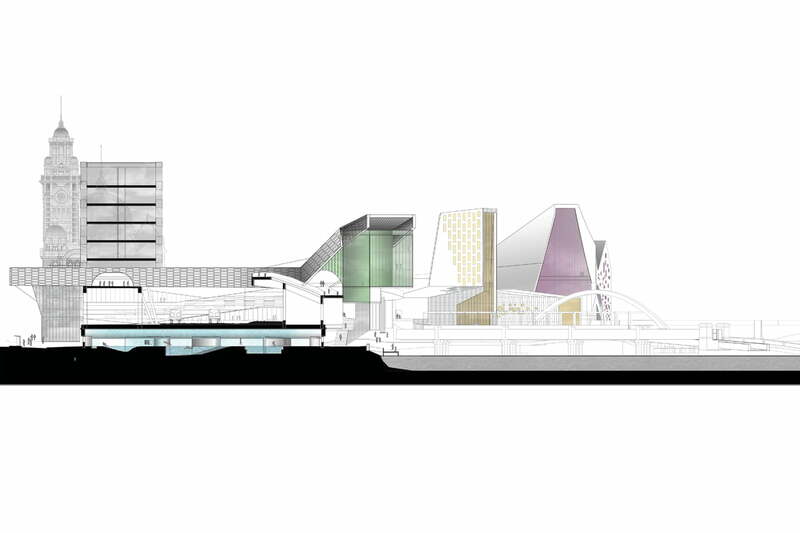 Nearby educational and community institutions —the CAE and the City Library—are relocated to the site and combined with a shared workplace.